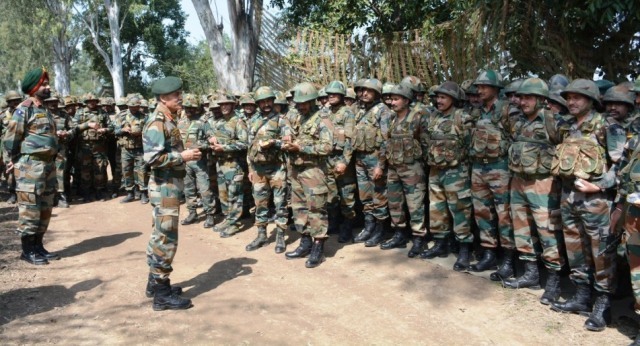 Jammu, March 13, (Scoop News)-Lieutenant t General JS Nain, General Officer Commanding, Rising Star Corps, visited “Tiger Division” to review the operational preparedness of the troops in the Corps Zone in view of the prevailing situation along with International boundary. During the visit to the Division and forward locations the Corps Commander interacted with troops deployed in the forward areas and was appreciative of the high state of morale of the troops on ground. Commanding (GOC) Rising Star Corps visited “Tiger Division” to review the operational preparedness of the forces in the Corps Zone in view of the current situation along with International boundary. During the visit to the Division and forward locations the Corps Commander interacted with troops deployed in the forward areas and was appreciative of the high state of morale of the troops on ground. The general officer was briefed by GOC “Tiger Division” on the current operational situation and the security scenario in Jammu Sector.